The roof thermal image helps pinpoint the cause of the leakage, even those that go undetected with the naked eye. NIR utilizes roof thermal imaging scan inspections to pin-point areas of moisture intrusion and target those areas needing repair or upgrade. Infrared analysis is a non-destructive testing method and can quickly identify large areas of saturation with an immediate thermographic image. Roof thermal imaging via infrared technology is used by NIR to detect moisture through temperature differentials across virtually every type of roof surface. Roof thermal imaging combined with NIR’s decades of moisture detection field experience allows NIR to make repair and upgrade recommendations which will help customers avoid costly premature roof replacements. Roof thermal imaging and thermal scans can quickly identify wet insulation. Thermal scans of a roof system and walls can help locate wet insulation which is indicative of a failing roof system and reduces the energy efficiency of the roof structure. The roof thermal image helps pinpoint the cause of the leakage, even those that go undetected with the naked eye. Extensive wet insulation will lead to discussions regarding whether or not a complete roof replacement is necessary, before potential emergency situations result from a complete roof failure. The sooner a roof problem is found, the sooner it can be addressed. Preventative roof maintenance will help enhance the lifespan of an otherwise good roof structure and will help reduce the amount of damaged roof product ending up in a landfill. 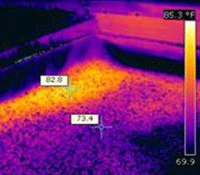 Roof thermal imaging can be a greener solution.